College Equal Suffragists, Chinese Women Dine Together Celestial Speaker Thanks Her American Sisters Heartily. Group picture of Chinese guests and prominent suffragists who attended luncheon yesterday. Front row, left to right – Bertie G. Chan, Mrs. Herbert Low, Edna Low, Mrs. S. K. Chan, Ida tong, Mrs. Ng Tong. Back row – Mrs. La Reine, Helen Baker, Buelah Tong, Mrs. Sarah E. Comerford, Fannie Chan. 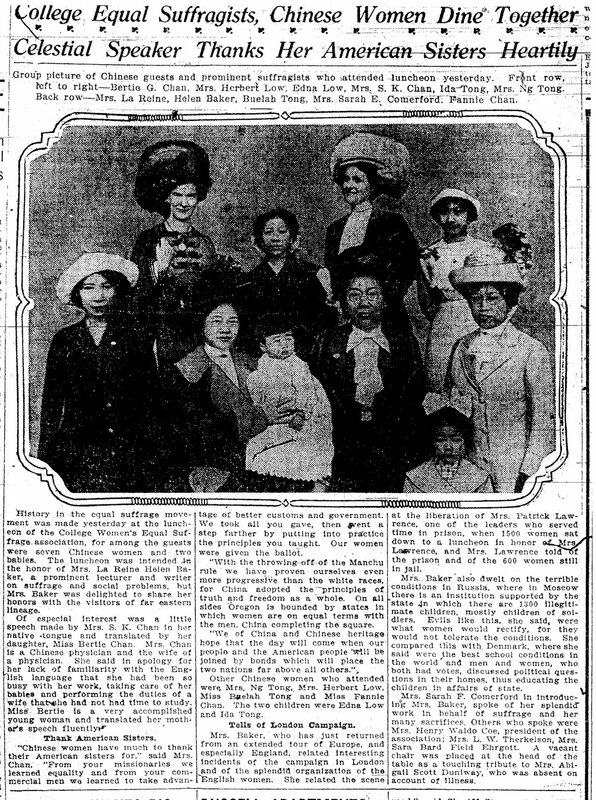 History in the equal suffrage movement was made yesterday at a luncheon of the College Women’s Equal Suffrage association, for among the guests were seven Chinese women and two babies. The luncheon was intended in the honor of Mrs. La Reine Helen Baker, a prominent lecturer and writer on suffrage and social problems, but Mrs. Baker was delighted to share her honors with the visitors of far eastern lineage. Of especial interest was a little speech made by Mrs. S. K. Chan in her native tongue and translated by her daughter, Miss Bertie Chan. Mrs. Chan is a Chinese physician and the wife of a physician. She said in apology for her lack of familiarity with the English language that she had been so busy with her work, taking care of her babies and performing the duties of a wife that she had not had the time to study. Miss Bertie is a very accomplished young woman and translated her mother’s speech fluently. “Chinese women have much to thank their American sisters for,” said Mrs. Chan, “From your missionaries we learned equality and from your commercial men we learned to take advantage of better customs and government. We took all you gave, then went a step farther by putting into practice the principles you taught. Our women were given the ballot. “With the throwing off of the Manchu rule we have proven ourselves even more progressive than the white races, for China adopted the principles of truth and freedom as a whole. On all sides Oregon is bounded by states in which women are on equal terms with the men, China completing the square. Other Chinese women who attended were Mrs. Ng Tong, Mrs. Herbert Low, Miss Buelah Tong and Miss Fannie Chan. The two children were Edna Low and Ida Tong. Mrs. Baker, who had just returned from an extended tour of Europe, and especially England, related interesting incidents of the campaign in London and of the splendid organization of the English women. She related the scene at the liberation of Mrs. Patrick Lawrence, one of the leaders who served time in prison, when 1500 women sat down to a luncheon in honor of Mrs. Lawrence, and Mrs. Lawrence told of the prison and of the 600 women still in jail. Mrs. Baker also dwelt on the terrible conditions in Russia, where in Moscow there is an institution supported by the state in which there are 1300 illegitimate children, mostly children of soldiers. Evils like this, she said, were what women would rectify, for they would not tolerate the conditions. She compared this with Denmark, where she said were the best school conditions in the world and men and women, who both had votes, discussed political questions in their homes, thus educating the children in affairs of the state. Mrs. Sarah F. Comerford in introducing Mrs. Baker, spoke of her splendid work in behalf of suffrage and her many sacrifices. Others who spoke were Mrs. Henry Waldo Coe, president of the association; Mrs. L. W. Therkelsen, Mrs. Sara Bard Field Ehrgott. A vacant chair was placed at the head of the table as a touching tribute to Mrs. Abigail Scott Duniway, who was absent on account of illness.